With a combination of timeless style and contemporary fashion, velvet flower pins make a wonderful accessory to many outfits. Jewelry can be made from many different materials. While we think of jewelry being formed from precious metals and stones, beautiful and striking adornments are available in materials ranging from manmade plastics to fabrics and textiles. Throughout the ages fabric and textiles have been used to make jewelry; think of the classic fabric chokers worn in medieval Europe or the luscious embroidered and woven items found at the sites of ancient civilizations. Some craftsmen would weave silver and gold into fabrics, blurring the distinction between jewelry and garments. Today, fabric jewelry is extremely fashionable and a variety of items are available. One of the most popular items of jewelry is flowers made from velvet. The soft elegance of velvet reflects the beauty of a flower and looks wonderful when worn as pins or brooches. The rich texture of the velvet complements other jewelry and looks great worn with other items of jewelry formed from both silver and gold such as flower earrings. Flowers are extremely versatile: tiny little fabric buds make delicate items of jewelry, whereas larger, more flamboyant flowers can make a dramatic statement. 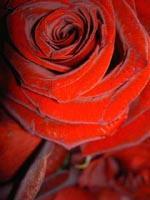 Roses are a traditional flower used in many items of jewelry, however there are many other types and styles. Lilies, poppies and other flowers are also popular choicse. Velvet is also available in a wide range of colors, from muted subtle pinks and beiges to vivid and vibrant shades. Often flowers are decorated with various beads -- these might be sparkling crystal beads or even gemstones. Velvet flowers look fantastic when worn with both formal and casual outfits. A flower pin worn on a woolen sweater teamed with jeans and boots gives a feminine finish to this classic casual outfit. Alternatively, a velvet flower brooch would complement an outfit worn for a wedding or other special occasion. There are many other interesting ways of wearing flowers. These can look great when attached to hats or berets. An otherwise plain hat can be brightened up or given a new lease of life by the addition of a flower or two. These can also look wonderful when attached to handbags, scarves or even used as mobile phone charms. Velvet flower jewelry is available from many high street and online stores. These items of jewelry are also sometimes referred to as accessories meaning that they can be found in a wide variety of stores and not just traditional jewelers. In addition to mainstream stores and jewelers, many artisan craftsmen make one of a kind items of fabric jewelry. These are made using a variety of fabrics and some artisans specialize in the use of antique or vintage fabrics. These handmade items can be found in craft galleries or craft markets and online from specialist websites such as Etsy.com who are dedicated to selling handmade items. If your hunt for the perfect pin remains fruitless, then many craftspeople are delighted to take commissions and to create a piece of jewelry to your requirements. This might include matching fabrics to an outfit, or even creating you a flower pin out of your own vintage or antique fabrics. This can be a lovely way of making a very personal or special item of jewelry. Fabric jewelry is more susceptible to dirt and staining than metal jewelry. The delicate nature of the velvet means that dirt that would simply brush off of metal jewelry might be difficult to clean off of fabric meaning that specialist cleaning will be required. The supplier will be able to advise on the best way to look after and care for your velvet jewelry. Velvet flower jewelry is a wonderful way of bringing timeless style and elegance to your wardrobe.